Since the discovery of the corpuscular nature of radiation by Planck more than fifty years ago the quantum theory of radiation has gone through many stages of development which seemed to alternate between spectacular success and hopeless frustration. The most recent phase started in 1947 with the discovery of the electromagnetic level shifts and the realization that the exist- ing theory, when properly interpreted, was perfectly adequate to explain these effects to an apparently unlimited degree of accuracy. This phase has now reached a certain conclusion: for the first time in the checkered history of this field of research it has become possible to give a unified and consistent presen- tation of radiation theory in full conformity with the principles of relativity and quantum mechanics. To this task the present book is devoted. The plan for a book of this type was conceived during the year 1951 while the first-named author (J. M. J. ) held a Fulbright research scholarship at Cambridge University. During this year of freedom from teaching and other duties he had the opportunity of conferring with physicists in many different countries on the recent developments in radiation theory. 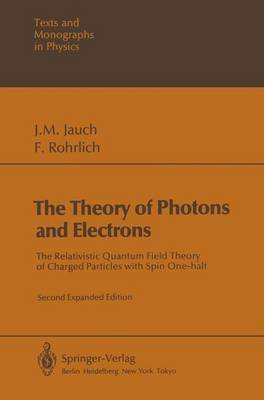 The comments seemed to be almost unanimous that a book on quantum electrodynamics at the present time would be of inestimable value to physicists in many parts of the world. However, it was not until the spring of 1952 that work on the book began in earnest.